Israel's air force is prepared to strike anywhere in Lebanon, including Beirut, the capital, if the Lebanese government fails to rein in Hezbollah guerrillas, the Israeli army chief said Thursday. Brig. Gen. Dan Halutz noted that all senior Hezbollah leaders live in and have offices in the southern Beirut neighborhood of Dahiya. He said Beirut could be included among the targets if Hezbollah rockets continue to hit northern Israel. "Nothing is safe (in Lebanon), as simple as that," he said. Hezbollah guerrillas threatened in turn to attack with rockets the major Israeli port city of Haifa and its surroundings if Israel strikes Beirut and its southern suburbs. By bombing the Beirut airport and imposing a naval blockade, Israel is trying to stop the flow of supplies to Hezbollah, reports CBS News correspondent Robert Berger (audio). Lebanese officials say 47 people have been killed in air strikes across the country. One Israeli woman was killed Thursday in a wave of Hezbollah rocket attacks. Meanwhile, Hamas held talks with Egypt on Thursday on trying to revive mediation with Israel over the release of an Israeli soldier held by the Palestinian militant group, senior officials said. But "Israel has made it very clear that they are not prepared to negotiate directly with Hamas or Hezbollah or any militants whatsoever," reports CBS News chief foreign correspondent Lara Logan. "There is talk of negotiations through a third party countries like Egypt and Turkey, but really the political side of this has been damaged by the escalation in the military campaign here." President Bush, at a news conference in Germany Thursday, said that Israel has the right to defend itself. He criticized Hezbollah, whose guerrillas mounted a cross-border raid earlier in the week and captured the two soldiers, for thwarting efforts for peace in the Middle East, and said Syria "needs to be held to account" for supporting and harboring Hezbollah. "If you really want the situation to settle down, the soldiers need to be returned," the president said. "It's really sad where people are willing to take innocent life in order to stop that progress. As a matter of fact, it's pathetic." Israeli forces are still trying to retrieve the bodies of four soldiers killed on the other side of the border who have now been lying there for more than 24 hours, reports Logan, and there's also no word on the fate of the two captured soldiers. Palestinian President Mahmoud Abbas Thursday said Israel's incursion into Lebanon has raised the specter of a large-scale Middle East war and urged world powers to intervene "to stop this serious deterioration." The shockwaves from the fighting began to be felt a day after Hezbollah snatched two Israeli soldiers in a cross-border raid. The escalation of violence in the Middle East pushed crude oil prices to a new intraday record of $75.88 a barrel. Western countries, Russia and the United Nations called for restraint and demanded the soldiers be released. "We are not at war, but we are in a very high volume crisis, and we have an intention to put an end to the situation here along the northern border," Brig. Gen. Dan Halutz said in Jerusalem. 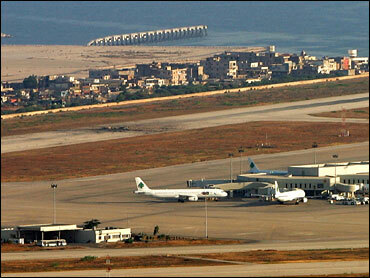 The airport, located in the Hezbollah-controlled southern suburbs of Beirut, was closed after the attacks and flights were diverted to nearby Cyprus. It was the first time since Israel's 1982 invasion of Lebanon and occupation of Beirut that the airport was hit by Israel. Israel also fired a missile at the building housing the studios of Hezbollah's Al-Manar TV in the southern suburbs of Beirut on Thursday morning, the channel's press officer Ibrahim Farhat told The Associated Press. One person was hurt, but the station continued to broadcast. Air force Maj. Gen. Amir Eshel said the campaign was likely Israel's largest ever in Lebanon, measured in number of targets hit in one night and the complexity of the strikes. The last major military offensive against Lebanon was in 1996 when about 150 Lebanese civilians were killed. Israeli Foreign Ministry spokesman Mark Regev said the offensive in Lebanon has far-reaching objectives, including pushing Hezbollah militants away from the Israeli border and eventually sidelining the group altogether. "We hold the government of Lebanon responsible for attacks carried out from its sovereign territory," said Israeli Army spokesman Jacob Dallal. "We are not at war, but we are in a very high volume crisis, and we have an intention to put an end to the situation here along the northern border," Halutz told reporters Thursday. An Israeli warplane bombed the Palestinian Foreign Ministry early Thursday, collapsing part of the structure and causing widespread damage in the area. It was Israel's second use of a huge bomb in Gaza City in as many days in its two-week offensive to pressure Palestinian militants to release a captured Israeli soldier. At least 23 Palestinians were killed in Gaza on Wednesday. The third and fourth floors of the Foreign Ministry were destroyed in the blast that shook the city and damaged houses and vehicles in the area. At least 13 people were injured, all in nearby houses. The Israeli military confirmed it had carried out an airstrike on the ministry, noting that it is "led by Hamas." Israel's offensive is aimed primarily at Hamas, which claimed responsibility for the capture of the soldier in a cross-border raid on June 25. Israeli officials on Thursday accused Palestinian Foreign Minister Mahmoud Zahar of having known in advance of the militants' plot to attack an Israeli outpost and seize soldiers. Zahar "is part of a leadership that is involved in a very tangible way in terrorism and in violence," said Israeli spokesman Regev. "He had knowledge of the recent hostage taking, and he is part of a leadership that has orchestrated ... countless missile attacks against Israeli urban areas." Foreign Ministry spokesman Taher al-Nunu accused Israel of carrying out "organized terrorism that targets all the Palestinian people and aims to exterminate all government institutions, one after another, to prevent them from carrying out their duties." He said no one was in the building when the plane struck after 1:30 a.m. Thursday.